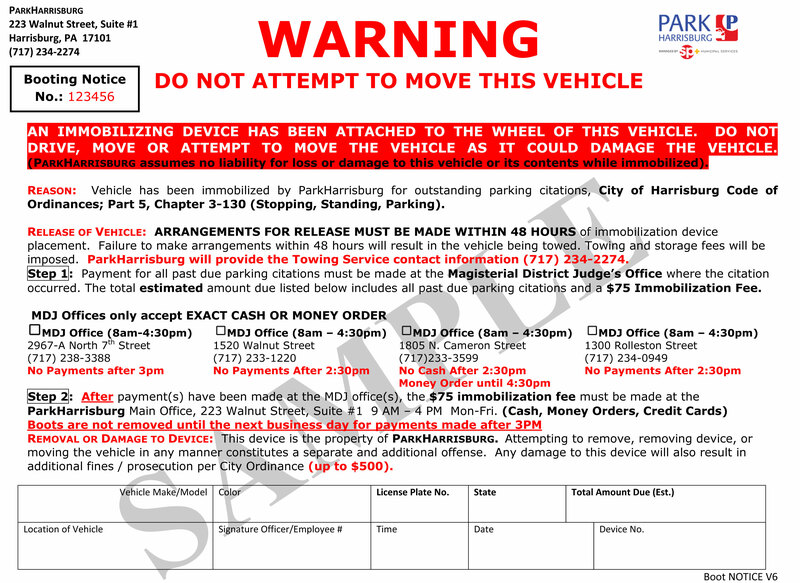 Effective April 11, Park Harrisburg will commence its booting enforcement program to collect delinquent parking fines and fees. Booting, which is required by city ordinance, had been delayed until the proper technology was developed to allow Park Harrisburg access to the most current parking records. Only motorists with three or more outstanding parking-related warrants will be subject to booting. SP+ will be including “Don’t Get the Boot” stickers on violation notices for any vehicles that would be eligible for a boot. To avoid getting booted, drivers with outstanding parking fines and fees are advised to contact the District Justice’s Office where the original infraction(s) occurred. Please click on the Sample Booting Notice below for more specific contact and payment information. 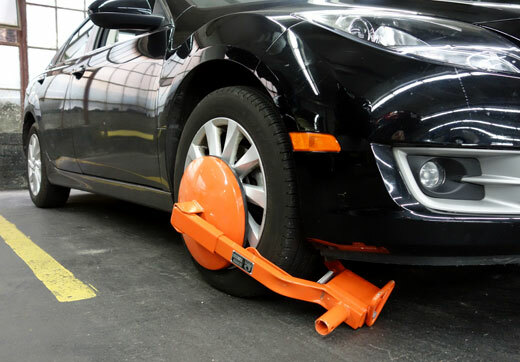 Once a vehicle is booted, the owner must pay all outstanding fines and fees to the District Justice’s office, as well as an additional $75 fee to have the boot removed. The Boot Removal Fee must be paid at the Park Harrisburg Office at 223 Walnut Street, Monday – Friday 9am – 4pm. Cash, Money Order and all major credit cards are accepted. If full payment is not made within 48 hours of booting, the vehicle will be towed at the owner’s expense. Click here to view a Sample Booting Notice.